Sensiteva: Foot сream contains seabuckthorn oil and plant extracts to restore the dry and cracked feet skin. Foot cream disinfects, stimulates and improves feet blood circulation, intensively moisturizes dry, cracked skin of the feet. Prevents the formation of calluses and corns, promotes healing of fractures. Suitable for men and women, and is also recommended for patients with diabetes. 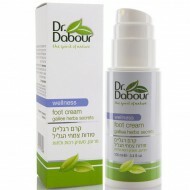 Foot сream contains seabuckthorn oil and plant extracts to restore the dry and cracked feet skin. Foot cream disinfects, stimulates and improves feet blood circulation, intensively moisturizes dry, cracked skin of the feet. Prevents the formation of calluses and corns, promotes healing of fractures. Suitable for men and women, and is also recommended for patients with diabetes. Application: Apply with massaging movements after every shower or bath. The natural oils of seabuckthorn, lavender and peppermint, Dead Sea minerals.